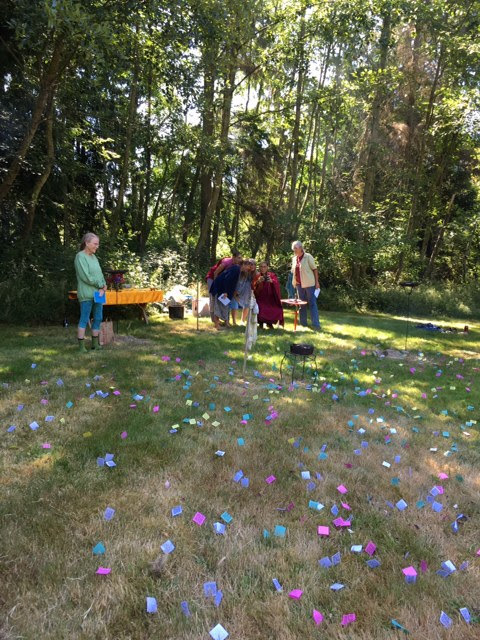 E Ma Ho…..we have beautiful news to share with you! 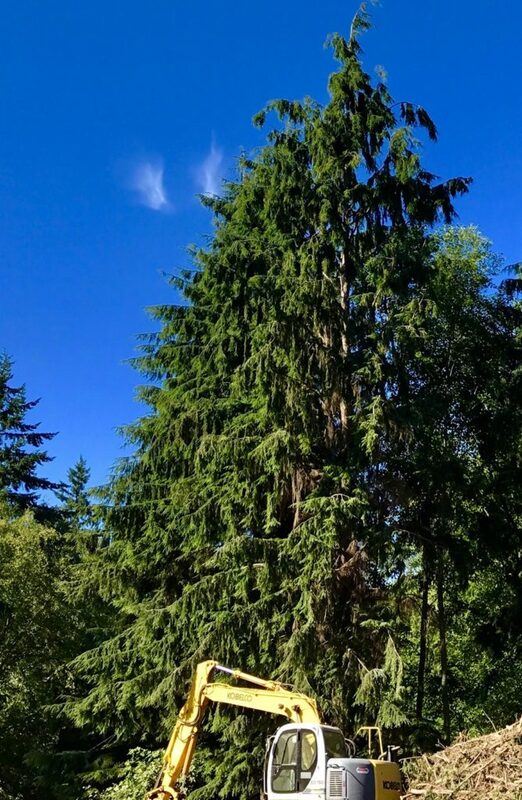 On Friday afternoon, July 7, we learned that the Building Permit for our Temple was scheduled to be completed in the coming week. Wonderful and amazing! Wonderful because at last we are going to be able to begin to construct our beautiful temple and Seat in the West for Kilung Rinpoche, and amazing because many of us on Whidbey had spent the majority of the day on Friday with Kilung Rinpoche preparing four treasure vases (one for each direction) to bury, with special instruction and prayers, under the land where the temple will be built. Rinpoche shared that Friday was an auspicious day astrologically. 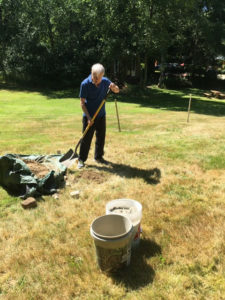 The whole process of preparing the vases – rolling mantras, preparing sacred substances, digging the 4 foot deep holes, more prayers, and finally placing and carefully burying the vases – was a blessed time of preparing the land for what is to come. At the end of burying the treasure vases we heard the news from the County that our Building Permit was nearly complete. Truly, it was an Auspicious Day!!! 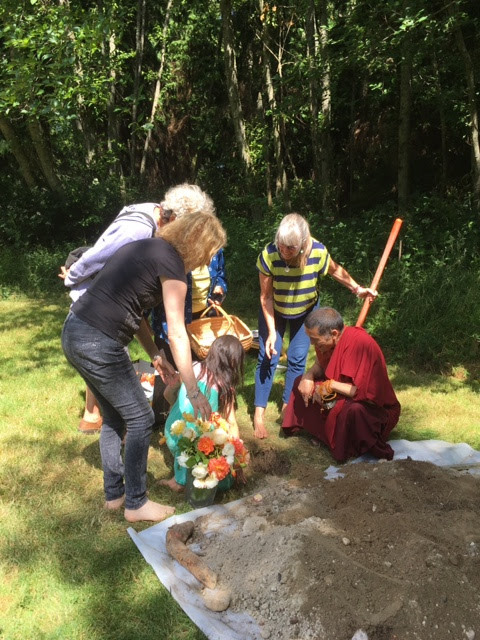 Rinpoche chose Friday, July 14th, another auspicious day, as a wonderful day to break ground on our project. There was a groundbreaking ceremony at 8:00 am. on the land. Be assured we will take lots of photos and videos as the project moves along and send out periodic reports as to how the temple is emerging from the precious land at Yeshe Long. 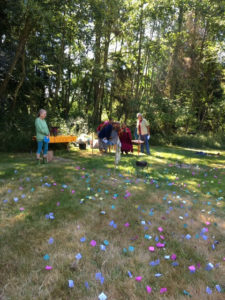 Already the new temple has become the center of inspired practice: on Sunday July 9, World Sang Day, we gathered for Riwo Sanchod practice on the temple site. 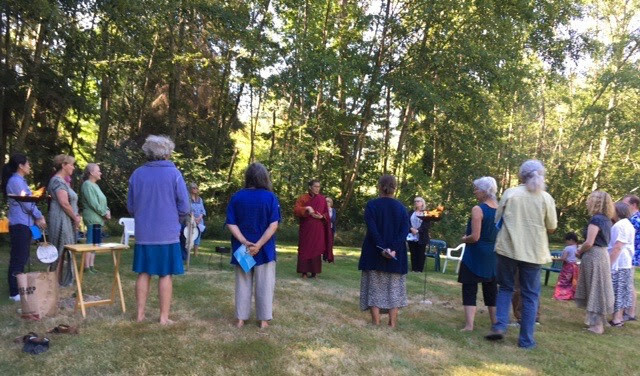 Rinpoche gave a beautiful teaching about the meaning of the role of lungta and the need to continually strengthen the spirit and cohesive vibrancy of the wind horse. There were fires burning sang in each of the four directions, as well as at the center of the temple site. 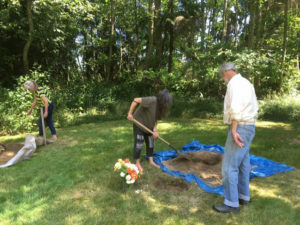 Thus we practiced in the space where the temple will be, honoring and respecting the land for what it is giving us, and making preparations for the changes to come for all the trees, plants, animals, and beings. Soon Rinpoche will leave for Tibet. There he will be taking the first steps towards rebuilding the Kilung Shedra and Community Center Complex, while knowing that his Seat in the West is being constructed here. 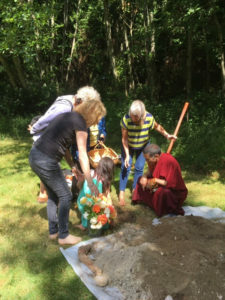 Please join together in sharing prayers of safety and auspicious accomplishment for Rinpoche and his family’s travels, and continued prayers for the removal of any obstacles, so that both temples may be simultaneously accomplished for the benefit of all beings. A special thank you to Art Petersen for his architectural design, to our contractor Damon Arndt from Next Generation Design and Build for his design work and patience, to site plan process consultant Larry Kwarsick for his guidance and consultation. 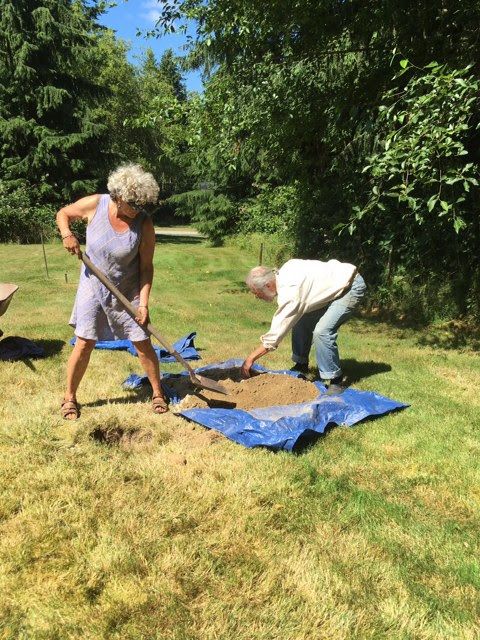 And a deep bow of gratitude to Lynn Hays and Nancy Nordhoff for making this project a reality. 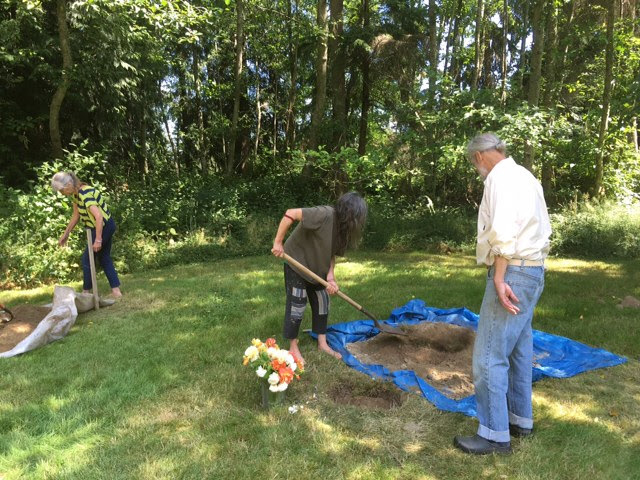 From Jeanne on Sunday, July 23rd: The clouds came during the ceremony of the burying of the treasure vases in the ground below the temple. 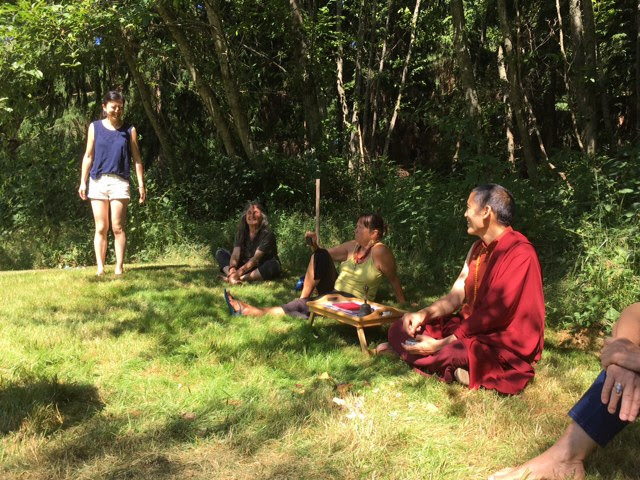 Rinpoche was interested in the clouds forming. He mentioned a story of Jigme Lingpa coming to Dzachuka to support the placement of the temple there, at the time of the First Kilung Rinpoche, Jigme Ngotsar Gyatso. There were special prayers said to help with locating the placement of that temple and 3 clouds appeared. Now with the treasure vases placed below and the formation of the clouds above, the temple will manifest in-between to benefit all beings. As Rinpoche was sharing the story, Padmasalle said the clouds looked like footsteps.